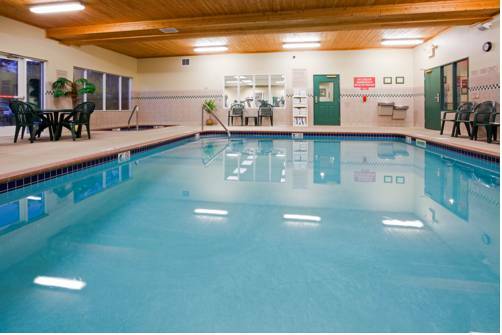 Centrally located in Marquette Township Business Corridor near shopping and dining, Restaurant (Buffalo Wild Wings) in parking lot, Complimentary hot breakfast, Indoor pool and whirlpool, Free wireless internet, On-site fitness center, Meeting room, Ski hill nearby, Trails for skiing, hiking, biking, snowmobiling, Public beaches, Near Northern Michigan University, Near Marquette General Hospital. Border Grill: 1145 W. Washington, Marquette MI 4985. 906-228-5228, fax 906-228-5336. Authentic fresh Mexican grill, 5 homemade salsas. Buffalo Wild Wings: 2500 US Hwy 41 W, Marquette, Mi 49855, 906-226-0699 Located in Hotel parking lot. Vierling Rest & Marquette Harbor Brewery: 119 S Front St, Marquette MI 49855 - Unique Historical Rest and Brew Pub specializing in fresh Lake Superior Whitefish. Meeting Room: 525 Square feet of meeting space. Room set up in configuration of your choice. $50 1-4 hrs, $100 5-8 hrs, $10 each additional hour. TV/DVD player, projector, WIFI, and sink included in cost. Beverages available on request. Downtown MarquetteCharming historical downtown with numerous shops to browse. Lake Superior - beaches, fishingMiles of sandy beaches, charter fishing and limitless hiking. Lakeview ArenaHome of the Marquette Iron Rangers and numerous hockey clubs. Lake Superior TheatreLakeside theatre presents several productions in a converted boathouse at the popular lower harbor. Marquette General HospitalFederally designated Regional Referral Center, Upper Michigan's largest health care service provider. Mattson Lower Harbor ParkLocated along Lake Superior just north of the ore dock and home of many festivals & celebrations. Marquette Mountain Ski AreaThree double chairlifts, rope tow, patrol, school, rentals, night skiing, cafeteria, bar and nursery. 906-225-1155. Noquemanon Trail NetworkThe Noquemanon Trail Network is an intricate ski & biking trail network located in the upper Peninsula of Michigan. Northern Michigan UniversityHome of the NMU Wildcats, Berry Events Center and Forest Roberts Theatre. Presque Isle ParkMarquette's recreational crown jewel. 323 acre forested island the juts into Lake Superior in the northern tip of the city. Upper Peninsula Children's MuseumNominal admission fee. Bring your imagination to see first hand the wonders of the world through the eyes of Upper Peninsula youth! Open daily Tuesday-Sunday. Hours vary seasonally. US Olympic Training CenterThe site of our nation's third United State Olympic Training Cener. US National Ski Hall of FameThe birthplace of organized skiing in the United States. WWW.skihall.com. Sugarloaf/Hogsback MountainGreat hiking for all levels of hikers.